This post is a slightly edited excerpt from an article we wrote for Reflections magazine. Plants need light – this is one of the first biology lessons children learn in school. Plants convert sunlight into forms of energy the plant can use to grow. Nearly everything humans eat is derived in some way from photosynthesis, whether the tomato picked from a garden or a ribeye steak that once grazed on grass. Sunlight seems like a plentiful enough resource, but there’s not always enough sunlight to go around. Sure, there’s plenty of light available for the tallest plant. But as those taller plants use most of the light, shorter plants may not be able to survive in the shade. Plants have been competing with each other for sunlight for millions of years and over time evolved mechanisms to help ensure they get enough. Plants growing in shade often tend to grow taller than they would in full sunlight. Growing tall allows the plant to more effectively compete with surrounding plants. The tallest plant in dense vegetation will certainly get enough light to survive and reproduce. But the energy and resources those plants use to grow tall can come at a cost; those plants might have a thinner main stem, fewer leaves, a less vigorous root system, or the amount of seed could be reduced. Light reflected from plant leaves. Red light and blue light are absorbed by plants and used for photo synthesis. Green light is reflected, which is why they look green to us. Far red light is also reflected, but is outside the visible light spectrum. The change in red to far red ratio is generally how plants ‘see’ other plants. Plants can begin this response of growing taller even before they experience shade. 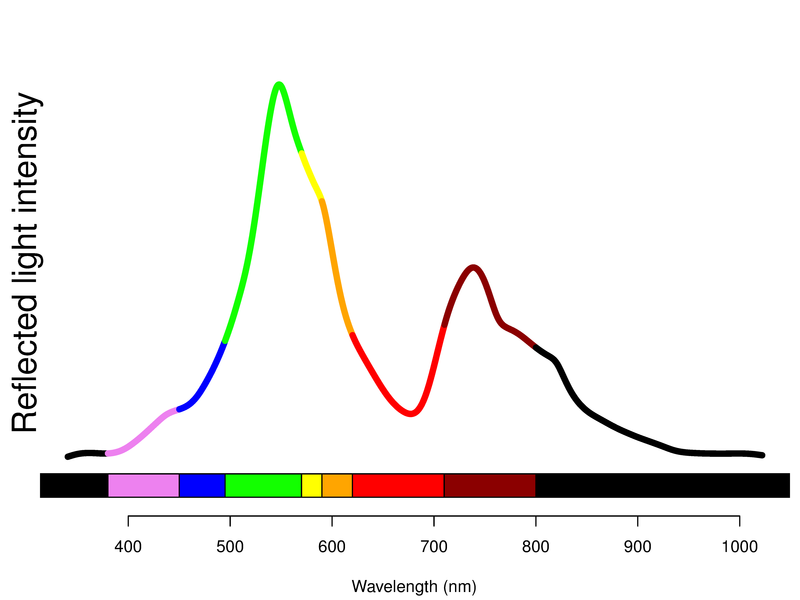 Plants can “see” nearby plants by sensing changes in reflected light quality (specifically, in the red and far red spectrum). And when they’re surrounded by other vegetation, many plants initiate what scientists have dubbed “shade avoidance” responses. Understanding these shade avoidance responses is important for crop production. Shade avoidance responses may be triggered in a crop plant surrounded by weeds or other vegetation like cover crops. Research from Clarence Swanton’s group in Canada has shown corn and soybean yield potential can be reduced if these shade avoidance responses are triggered early in the crop growing season. 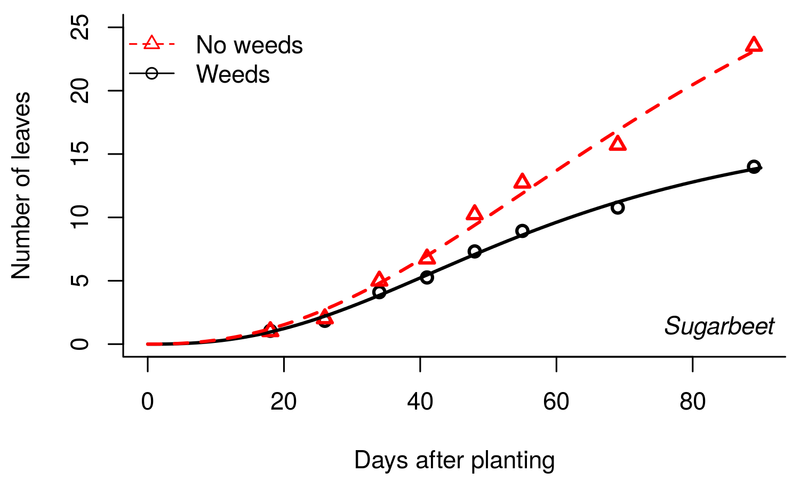 Even after weeds are removed by tillage or using herbicides, the crop plants may not be able to recover their earlier yield potential once shade avoidance responses are initiated. 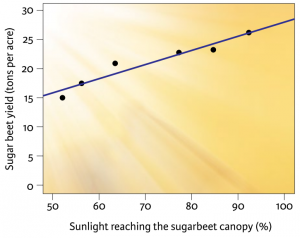 The effect of light quantity on sugarbeet yield. 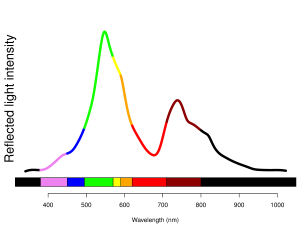 This response is different from shade avoidance responses, which occur due to light quality. Weed control is critical for all crops, as weeds will compete with the crop for essential resources. But getting rid of weeds is particularly important in low-statured crops. Sugarbeets, when grown for sugar, don’t produce a tall main stem but rather a rosette of leaves that may only reach up to 2 feet tall. Consequently, sugarbeet is a relatively poor competitor for light. Our research has shown a 1-percent yield loss in the sugarbeet crop for each 1 percent of full sunlight intercepted by weeds. But this is the effect of direct shading of the crop by weeds, and is different from shade avoidance. 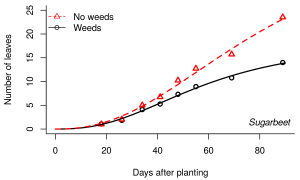 Growth may be affected through shade avoidance responses even before the weeds grow taller than the sugarbeet crop. Unlike many agronomic crops, sugarbeets do not produce a main stem in the first year of growth, so they have little capacity to grow taller. Sugarbeets are also different from most agronomic crops because they are a biennial species, and instead of harvesting seeds (like for corn, wheat, or beans), the large storage root is harvested after the first year of growth. So it was unclear at the beginning of this project how shade avoidance responses might affect growth of a sugarbeet. Graduate students Louise Lorent, Tom Schambow, and Albert Adjesiwor have conducted many studies over the last several years to see how sugarbeets respond to reflected light. [Here’s a video of Louise describing some of the methods.] We’ve used many different colors of plastic mulch, as well as some different iterations using actual weeds surrounding the beets. For the weedy studies, the sugarbeet plants and weeds were grown in separate containers to ensure the roots didn’t interact and weeds were not robbing water or nutrients from the sugarbeets. We only allowed the weeds to interact above ground, reflecting light toward the sugarbeet plants. We also kept the weeds clipped to prevent any direct shading of the crop. Sugarbeet leaf development was slowed significantly by the presence of surrounding weeds. Sugarbeet plants growing near weeds produced significantly fewer leaves. The difference between the weedy treatment and the control continued to increase until the beets were harvested three months after planting. Plants surrounded by weeds produced about 62% less leaf area than sugarbeets surrounded by soil. Because of the limited leaf area, those plants were less able to convert light energy into carbohydrates through photosynthesis. This resulted in roots 70% smaller than beets grown without weeds nearby. Although we expected there to be some response of sugarbeet to surrounding weeds, we were pretty amazed by the magnitude of the response. In fact, we didn’t believe it at first, we assumed something must have gone wrong. As scientists we’ve been trained to be skeptical, even of our own observations. So we conducted some additional greenhouse tests using different methods to try and refute the earlier results. But the response was the same. Our results suggest that weeds can significantly reduce crop yields even if they don’t deprive the crop of resources like water and nutrients. We’re certainly not the first to show this. But I do think that the impact of shade avoidance responses on crop-weed interactions is still under-appreciated. And the magnitude of the impact on crop yield may differ greatly between crops. It seems this is a much more important issue for root crops compared to seed crops (like corn or soybean). Even though we now believe our results (and we think they’re really cool! ), we’re still a long way from having this all figured out. The results here are one small component of a much larger project. We still need to figure out how timing of weed removal or emergence relates to the magnitude of response. We need to determine how important shade avoidance is relative to other aspects of weed competition (like water and nutrient use). And what about weed density? How many weeds are required to induce this response? Answering all these additional questions will take years. Plus there’s a pretty good chance we’ll mess something up trying to answer those questions and have to re-do some things. It has taken us about 5 years of doing, learning, and re-doing to get this far. Science can sometimes be frustratingly slow, especially whole-plant ecology research that takes an entire year to conduct a single study. But projects like this definitely make it worth the wait. This research has been supported by a competitive grant from the Wyoming Agricultural Experiment Station, as well as funding from the Western Sugar Cooperative.